China's social media and video game giant Tencent overtook Facebook in market value on Tuesday as investors sent the company soaring to the top five list of the world's biggest firms. tech company's earnings have repeatedly outmatched analysts' expectations. A second stock connection with mainland China which opened late last year has allowed even more money to flow onto the semi-autonomous city's exchange. By Tuesday afternoon Tencent's market capitalisation had reached 4.15 trillion Hong Kong dollars ($531bn), surpassing the US social network's $519bn. The market movement made China's Tencent one of the world's top five most valuable companies, although it is still far short of leader Apple which is currently valued at $873bn. Tencent has nearly one billion users on its popular WeChat phone platform, where people can chat, post photos, play games, transfer money and pay for a variety of services in China. The must-have app has revolutionised China's tech industry, with even the media and publishing sectors seeing changes to how Chinese consume and pay for content. 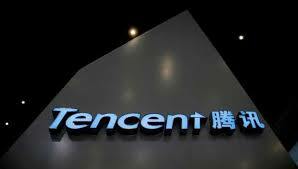 Tencent's publishing-focused arm was spun off and listed in Hong Kong earlier this year.